MONTREAL--(BUSINESS WIRE)--Metro Optic, a leading provider of high-speed fibre optic networks and interconnection data centres based in Montreal, has partnered with Epsilon, a privately owned global communications service provider headquartered in Singapore to deliver global on-demand connectivity to the Canadian market through its data centres in Toronto and Montreal. Epsilon’s on-demand connectivity platform, Infiny, gives users on-demand access to its global interconnect fabric, which includes more than 600 network operators, cloud service providers (CSPs) and internet exchanges (IXs). The platform enables direct connectivity to world-leading cloud service providers including Amazon Web Services (AWS), Google Cloud platform, Microsoft Azure and Alibaba Cloud as well as more than 90 data centre locations globally. Epsilon has recently announced that it will be deploying next-gen 100 Gigabyte per second (100G) packet optical switched ethernet technology to enable hyper-scale connectivity to support the growth of Big Data, IoT and Cloud on a global scale. The deployment will enable Epsilon to serve Metro Optic’s Canadian customer base with 100G connectivity on-demand via its Infiny platform. “With a fast-growing ICT sector and a thriving interactive media industry, Canada has evolved into an important global digital hub,” said Carl Roberts, Chief Commercial Officer at Epsilon. 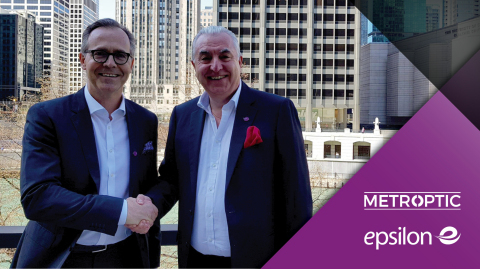 “We are looking forward to working with Metro Optic to support the growing international connectivity and interconnection requirements needed by this business sector. Epsilon will offer direct access to the US market while acting as a bridge to both Europe and Asia. Our partnership also gives us significant reach into the Canadian market and allows us to continue to execute on our vision for global cloud-centric networking”. Support documents such as a fact sheet on Metro Optic, the company logo, bios and photos of its principals, are available in this dropbox/click here. Metro Optic is Canada’s largest independent, carrier-neutral operator of high-capacity fiber networks and carrier-dense interconnection and colocation facilities. The company offers dark and lit fiber solutions to medium and large sized businesses, telecom carriers, cloud operators, wholesalers and datacenter operators. The Metro Optic network reaches critical corporate and wholesale datacenters and interconnection locations in the greater Montreal and Toronto areas. Under the I.C.E Datacenters brand (www.icedatacenters.com), Metro Optic operates multiple carrier-neutral, fiber- and provider-dense interconnection datacenters in Canada. These include leading interconnection sites in downtown Montreal and in Markham (Toronto). Metro Optic is a leading player for digital growth in Canada. For more information visit www.metrooptic.com . All Epsilon services are powered by a next generation hyper-scalable global backbone which connects all the leading telecoms hubs globally. Across this fabric encompasses a dense ecosystem of carriers, service operators and Cloud providers offering the leading interconnect point for a diverse set of network and connectivity requirements. For more information, visit www.epsilontel.com.